Some things in life are just not fair. It’s a fact of life. Often we find ourselves peering over the proverbial fence seeking greener pastures and wondering why we were once again picked last for dodgeball -a reality many of us have faced at one time or another. It seems that Volkswagen has forgotten this cruel life lesson as they have created yet another unbalanced scenario. 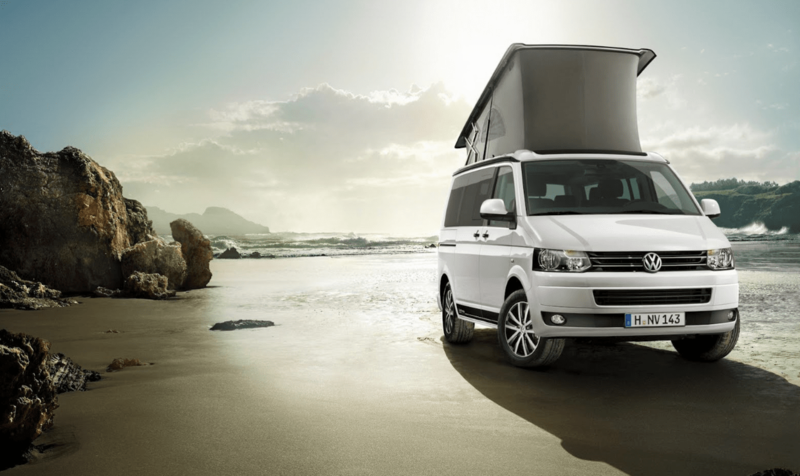 Herein lies the VW California, a modern reincarnation of the beloved bus of yesteryear that stole the hearts of every would-be traveller from young to old. It seems that the Germans have resurrected one of the most iconic vehicles in history and saw fit to call it the “California”, and here’s the kicker: despite its namesake, it’s not available in North America. 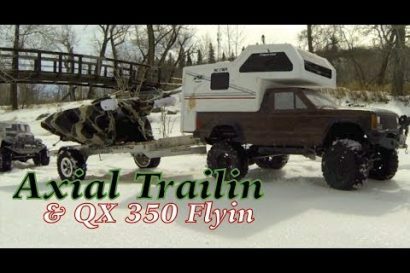 This latest T6 camper chassis comes in two flavors, the Beach (sans kitchenette) and the Ocean, a fully equipped camper that draws inspiration from the classic layout. Let’s go over a few of the new features. Beginning with the Beach, which is the base platform, we see a myriad of upgrades in both functionality and safety. All of which add greatly to the end user experience. Both front seats pivot at their base adding 2 seats to the dining arrangement creating a total of 4 seats at the removeable table (the collapsible table is standard equipment and stows in the sliding door). 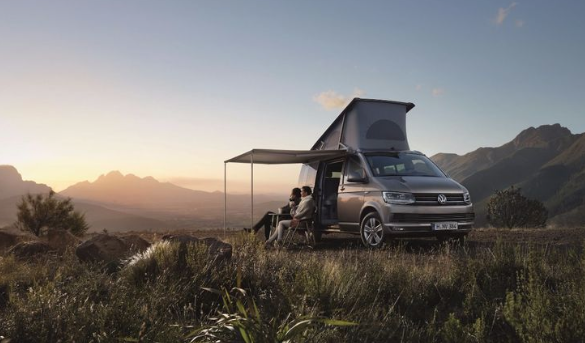 VW also offers an optional vehicle mounted awning where campers can enjoy the shade in a pair of collapsible camping chairs -which conveniently store in the liftgate when not in use. Not one to break tradition, VW added an aluminum pop top that hinges at the rear. The added height creates room for the slatted bed frame which supports a 2000mm x 1200mm mattress. 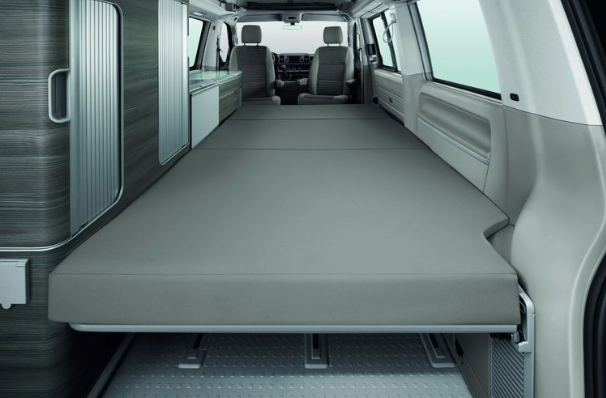 For those on the primary level, the seats fold down to create a 2000mm x 1500mm bed (roughly the size of a standard queen mattress). An illuminated entry step adds a touch of class and provides a spot of safety at night. 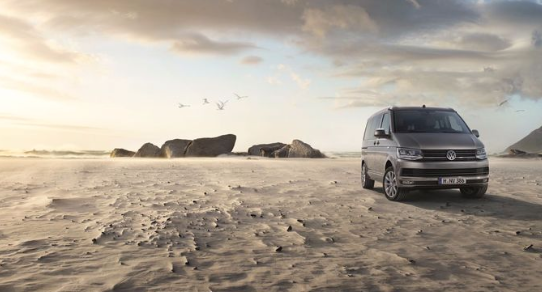 Both California models are available with several state of the art safety systems. Features such as corner lights that illuminate the road around dark corners, as well as strategically placed sensors aim to provide safer travels by reducing blind spots. 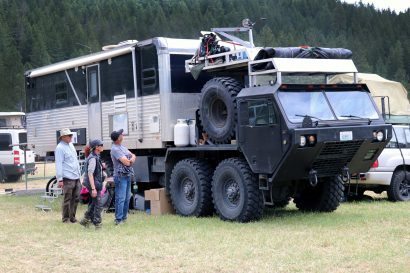 Neither version is equipped with a low range transfer case, instead the California make use of the company’s proprietary 4MOTION all wheel drive system and optional electronic differential lock. The optional 4MOTION system monitors individual wheel speeds and uses braking force to ensure power is delivered to the wheels with traction. 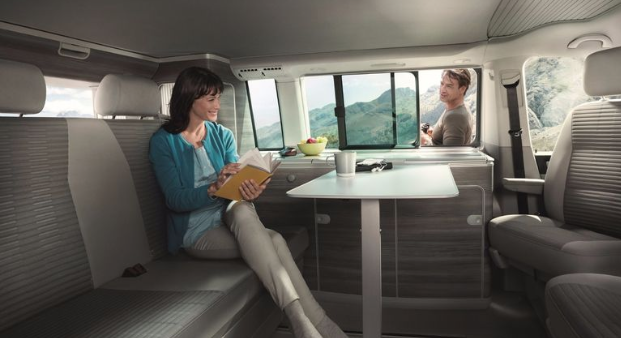 Similar to the Beach model, the Ocean enjoys a pop top with bed, seats that fold into a bed (although, smaller at 2000mm x 1140mm), only with the addition of a kitchenette, wardrobe -with sliding door, and gas storage compartment. 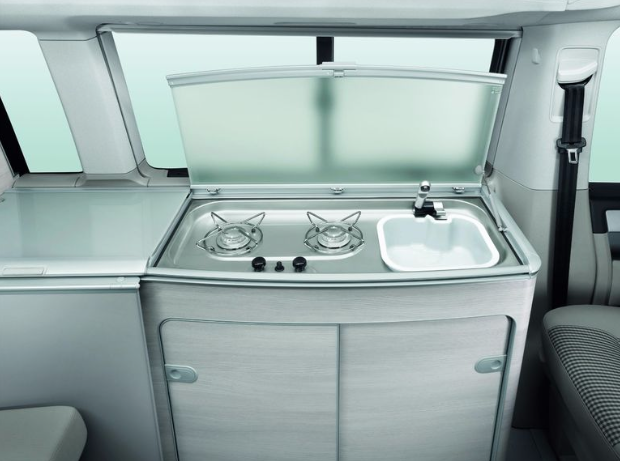 The comprehensive kitchen includes a 42 liter fridge, twin burner gas stove, and stainless steel sink. The interior cabinetry is sleek and modern with a frosted glass worktop for easy cleanup -rounded edges afford a contemporary appearance and create an elegant environment overall. 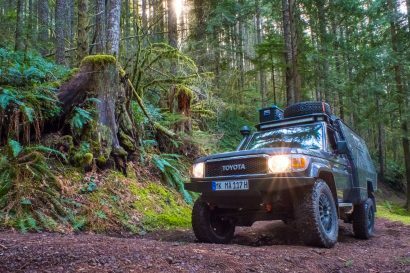 Whether enjoying the latest copy of Overland Journal in the top bunk, or a glass of wine over dinner, campers will no doubt find the multi directional flexible halogen lamp useful. VW put a lot of thought into the latest iteration of the classic campervan, and it would appear as though they have paid proper homage. Many of the old bits of charm remain despite the inherent intrusion of technological progress. Whether its the simplicity of the Beach that you desire, or the at home convenience of the Ocean, either model will surely bring a smile and sense of nostalgia to your adventures. For many, a brand new VW campervan is a reality. As for the rest of us, we will have to continue watching the game from the sidelines. 4 cylinder, 2.0TDI 140ps common-rail, direct injection, variable geometry turbocharger, intercooled. 4 cylinder, 2.0 114ps stratified injection, turbocharged petrol engine. Multi-directional flexible halogen spot light directs light into seating area and top bunk. Fuel consumption: up to 40 MPG (depending on trim level).